The holidays are upon us and many of us want to celebrate the special women in our lives with jewelry. Based on the commercials and marketing, a diamond is a girls best friend and diamonds are forever. Thats nice and all, but how do you (or she) feel about them? The subject of Blood Diamonds (or conflict diamonds as they are also known) has been raised to a much higher mainstream level of consciousness, so there are social responsibilities to consider, but what about ecological? Mining isn’t exactly eco-friendly, and its not something that many think about when purchasing jewelry. So what are we left to do to ice out or make our girls feel special- is there such a thing as an ethical diamond? Ok, I’m done asking questions and it’s time to start providing answers. I’m going to cover mined diamonds, reclaimed diamonds, synthetic diamonds, and diamond simulants. Each has its own benefits and varying impacts on the environment to produce, just think of how educated you will become! First lets start with real diamonds. The process of mining isn’t pretty, not only are you creating huge holes in the earth, but there is a lot destruction of rivers, ecosystems around mines, pretty much leaving the area around them one big fat dead zone. The diamond industry has attempted to address the blood diamond issue (slave labor used by militant factions to fund wars, destroy countries, etc.) by introducing the The Kimberley Process which brags conflict-free diamonds. Its a start, but hasn’t stemmed the flow (or tracking) of the diamonds past or originating country. But all hope is not lost! Your best option, if you must have a mined diamond, is to choose an ethical jeweler with an independent trusted source for fair trade diamonds such as Brilliant Earth, or go through ethical diamond mining sites such as Pride Diamonds which promote sustainable communities and mine with care. Additionally, one of the most important things to do when purchasing a conflict-free diamond is to require a written warranty verifying the diamonds source and chain of custody. This will hold the jeweler responsible for their claim of labeling and selling a conflict-free diamond. Alternatively, there are plenty of diamonds out in circulation already, case in point, i plan on remounting the vintage diamonds my grandmothers wedding ring in a more modern setting for my own wedding. If you don’t have your own heirloom diamonds, GreenKarat features recycled and reclaimed jewelry including engagement rings and diamonds. If you are feeling adventurous, check your local pawn shops- be sure to get an appraisal so you know what you are getting though. This may sound a little strange, but we actually have the technology and processes to create a real diamond. These are created using intense pressure and heat and a small real diamond ‘seed’. The seed is to provide the molecular structure building block for the sheets of carbon placed over the seed to duplicate. This takes care of the mining and social responsibility issues of a natural mined diamond, but is it eco-friendly? It is an energy intensive process duplicating the natural heat and pressure that forms natural diamonds, only its in a laboratory using 58,000 atmospheres of pressure at 2,300-degrees Fahrenheit until the material crystallizes. I would imagine that uses more energy than a 100watt light bulb, but probably nothing near the scale of the energy used for a mined diamond. Three major companies involved in manufacturing these gem quality true diamonds are Apollo (now SCIO Diamond), Gemesis (now Pure Grown Diamonds) and Chatham Created Gems. Due to current manufacturing restrictions, only colored diamonds are available in sizes larger than one carat. Because the diamond is created in a controlled environment, they are able to create a near perfect diamond every time. The cost for these cultured diamonds is approximately 15% less than a natural mined diamond, but the quality is usually superior. While classified as a diamond simulant, the moissanite jewel also occurs naturally, and is in fact much more rare than a diamond. First discovered within a meteor crater in 1893, it was mistaken for a diamond. Today they are created much like a cultured synthetic diamond. Having a higher refractive index than diamond, moissanite is the most brilliant of colorless jewels. Optically, moissanite has more light return (brilliance and luster) and 150% more white light refraction (known as fire) than diamonds. 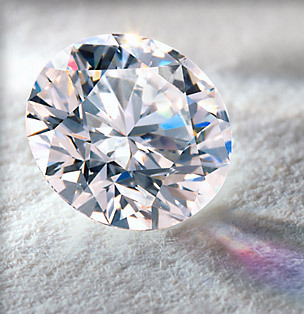 The carat size for a moissanite is a bit larger due to its density and optical properties. Clarity and color is comparable to a high quality diamond with VS clairty and I, J, or K in color. It is also much harder than all gems (natural and synthetic) second only to a diamond (9.25 on the Mohs scale of hardness). The only manufacturer of moissanite is Charles and Colvard, but you can find them at many jewelers. The ever popular and economical choice known as a cubic zirconiam is a synthetic gemstone with varying qualities. You can find these in costume jewelry stores, your local mall, clothing stores, really just about anywhere. There are varying grades of cubic zirconia, some resemble diamonds so much that it may be undetectable without using specialized equipment. Physical and optical properties of cubic zirconia vary due to the recipe of stabilizer used by the individual manufacturers and can take on properties all ranges of clairty & color. High quality CZs actually are somewhat superior to diamonds in their color (they can reach a perfect ‘D’ colorless), dispersion (reflection off the surface of the gem), clarity (they can be internally flawless, and have a lower refractive index (more ‘fire’). The downside is the hardness of CZs is about an 8, which makes it more vulnerable to scratching and dulling from everyday wear and tear. Available in just about every color, this is a low cost alternative to diamonds and other mined gems. The creation process is similar to that of moissanite as it is grown in a laboratory. There is a wide range of qualities within the zirconia arena, DiamondNexus carries a higher quality process of creating diamond simulants with their sister company 1215 Engagement Rings manufacturing true carbon simulants. Whatever your fancy, there is a greener option out there for jewelry, diamonds and gems- whether you prefer a traditional diamond or a cultured alternative. I know what I’m giving my lady, but I’m not telling! Thanks for providing this information on alternatives for conscious consumers. One point of clarification, just because Brilliant Earth carries Canadian diamonds, it doesn’t mean that they are more ethically sourced than diamonds from anywhere else. The environmental and social impact of mined diamonds doesn’t vary that much, but Canada is a conflict-free country. C5 company, a sustainable fine jewelry retailer, carries “ethically mined” and lab-created diamonds. It is up to the customer to decide which best matches their values. Read our website and blog for more information. Thanks for your comment and input, I am glad there are more companies like yours out there. Pingback: Niche Site Review - The Ecological (Green) Niche | Niche Marketing Ideas & Tips. Find a Niche Market Now! This is Danielle from Brilliant Earth. Great article! I thought it might be helpful to offer some additional information regarding Canadian diamonds in response to the above claims. The environmental and social impact of mined diamonds does vary greatly depending on the origin. Unfortunately, many of the world’s diamonds are harvested using practices that exploit and degrade children, communities, the labor force, and the local environment. Canada is one of the leaders of ethically sourced diamonds, and their social and environmental standards are light-years ahead of many other diamond rich countries that are currently involved in the diamond industry. These high standards protect caribou and other wildlife, water, and fish habitats, and include land reclamation and independent monitoring. Other sources of ethical origin diamonds are also beginning to become available. We are just beginning to offer one of the first sources of diamonds that are mined, cut, and polished in Namibia with fair labor and strong environmental practices. These diamonds provide much-needed jobs, health care and education for Namibia’s people. What’s most important is that customers continue to ask where their diamonds originate from, and under what conditions. Thanks again for the great article! you have nice diamonds an jewelry, i do the same in africa uganda, have a lot of stock. we can do business. Excellent article! It very clearly explains the different options available, which can be confusing to many people. The one other major synthetic diamond producer is AOTC, available through their retail front-end D.NEA. Our HPHT diamond growth machines use about 2kw of power while running, which compared to mining operations is very modest. We offer yellows up to two carats, blues up to 1.25cts and whites up to one carat. Good article + nice pictures. Keep going! Excellent explanation, though not all manufacturers of created diamonds are mentioned. There are just a few more companies outside of US. Just a note in regards to brilliant earth. The two Canadian mines they source from are owned by BHP Billiton and Rio Tinto, two mining companies with quite negative track records. Some of the top state owned pension funds in the world have devested from Rio Tinto due to it’s intense and continued ecological destruction. BHPBilliton, besides being the third largest company in the world also has many other operations that I personally do not condone. Lastly, although these mines might take into mind caribou, have they taken into mind the native Americans who utilize that land? Similar to http://www.herstone.com , great articles, greate effort in seperating the types of stones. Saves tons of time. Canadian diamonds must be mined, cut and polished within Canada in order to be certified as Canadian diamonds. 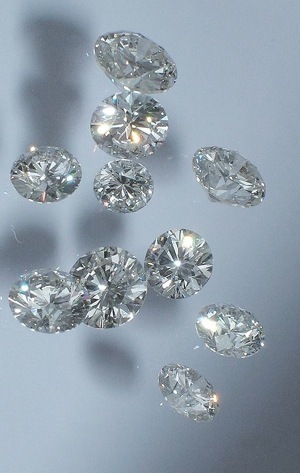 Look for diamonds accompanied by Canadian diamond certification. That is why companies like Tiffany’s have made significant purchases and investment in Canadian diamonds. For everyone else, Forever Brilliant Moissanite, is a great alternative as is cubic zirconia. Hello, I recently stumbled across this article, and as a member of the jewelry trade I was generally very impressed. There is a lot of misinformation out there about the differences between diamond simulants and synthetics. I was glad to see you explain that so clearly. I do think your picture of the Kimberly Process is a tad overly pessimistic. Right now, over 99% of the world’s diamond supply is from conflict-free sources. You can read more at: http://www.diamondfacts.org. 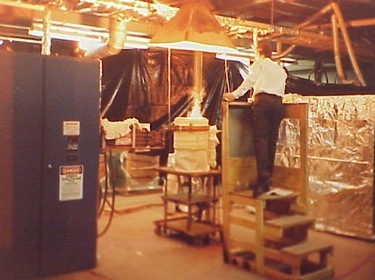 In fact, creators of the Kimberly Process and some of those who helped draft the scheme have criticized the effectiveness of the Kimberly Process, citing several examples of billions of dollars in conflict blood diamonds routed through Switzerland and Dubai to claim Kimberly Process certification. Hi there, is there any information out there on the environmental impact of moissanite production? For the cultured diamond you mention the high intensity energy use, but what about for moissanite? Thanks!